When I saw this polka dot sweatshirt online at Target, it instantly made me think of the artist Yayoi Kusama, who recently had a show at the Broad Museum, which is where these photos were taken. Kusama does a lot of installation art with dots, hence the connection between my sweatshirt and her art. 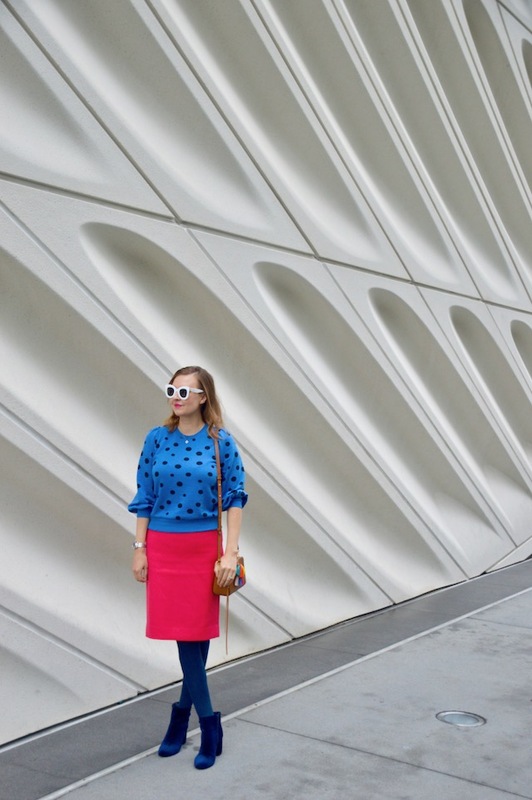 Last week, we were in Downtown Los Angeles, which is where the Broad Museum is located, so I thought it would be the perfect occasion to wear the sweatshirt. I guess you could say the sweatshirt could be conceived of as a work of art, albeit a very affordable work of art! 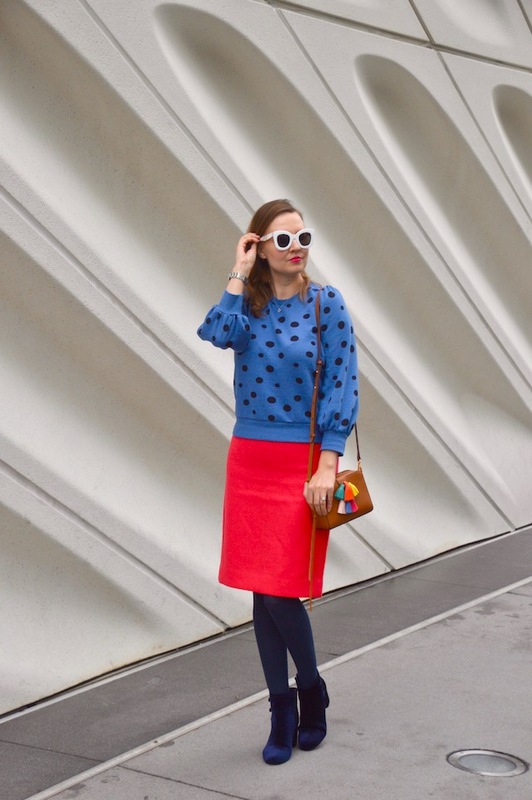 I wanted to pair my fun polka dot sweatshirt with another pop of color, such as this wool pencil skirt from J. Crew. The pencil skirt is actually sort of a dark pink color but it looks a little more red than pink in photos. 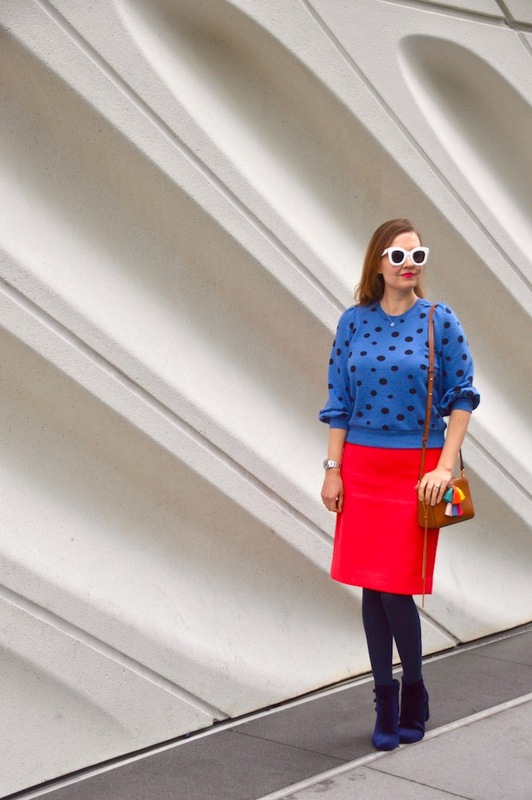 I also opted for a cute pair of navy velvet boots to pick up the navy dots in the sweatshirt. Last of all, there's my colorful tassel bag, which, to be quite honest, I haven't worn that much since summer! When I wore this outfit last week, it was a very cold and rainy day, so, I guess, breaking out the bag was my way of wishing for warmer weather and sunnier days in the near future! How long was your thought process on coordinating this one?! 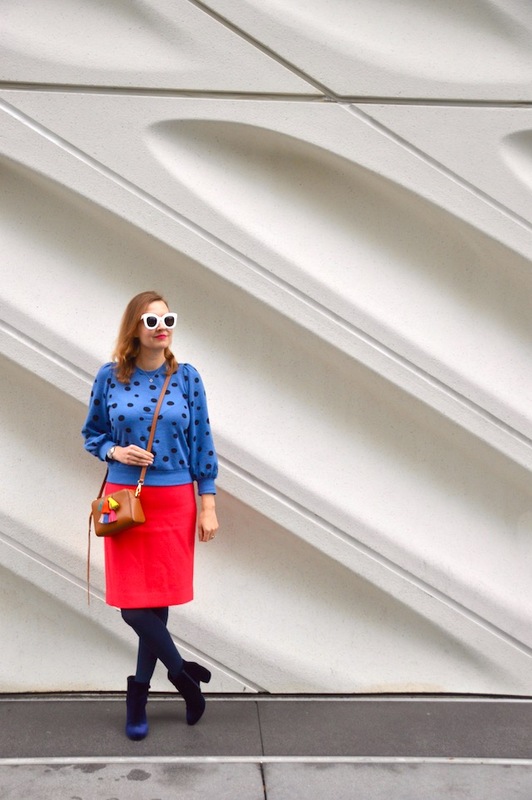 I'm digging the matching blues and how you balanced the bright blue top with the dark blue tights.